The Descente Layla Insulated Ski Jacket with Real Fur is elegant enough for a night out but packed with the features needed for the most advanced of skiers. And because serious skiers never want to stay inside when the temperatures are in the single digits, this high-quality ski jacket has 100g of insulation and professional-level waterproofing and breathability ratings. Other helpful exterior features include a pass pocket and a raccoon fur hood detail, while the inside houses everything from a powder skirt to mesh pockets and fitted cuffs. The Descente Layla Ski Jacket with Real Fur has a removable hood and separate soft inner collar, which is also removable for complete customization on the slopes. "How long is the coat (inches)?" "Thank you for your inquiry. 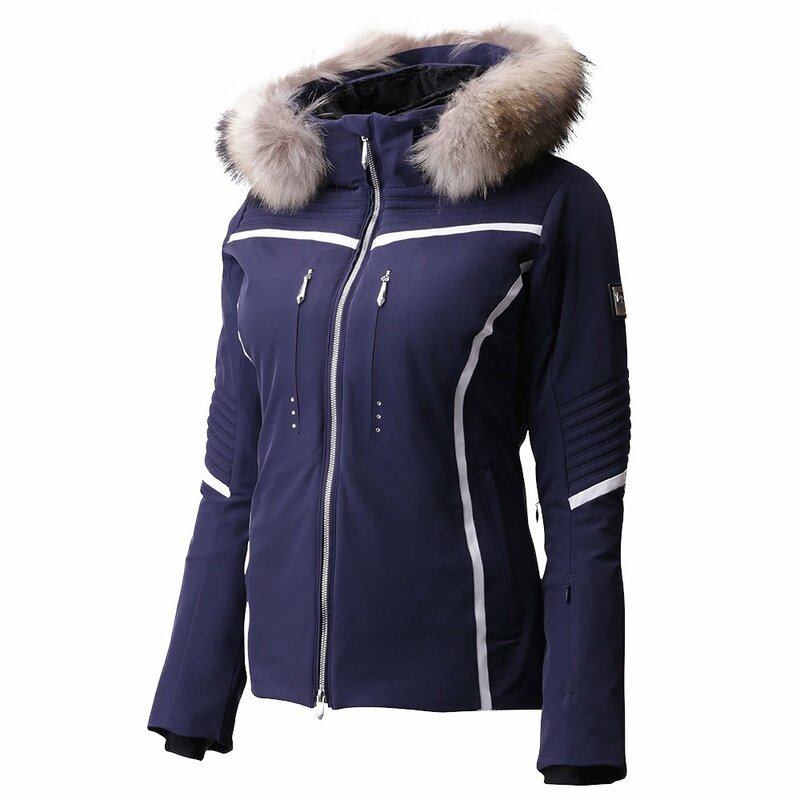 The length of the Descente Layla Insulated Ski Jacket with Real Fur is 25 inches long. We hope this information helps! " "For the white and black jacket, which white ski pant goes best with it? thank you!" "Thank you for your inquiry. According to what customers also bought with this jacket. We recommend taking a look at the Descente Selene Insulated Ski Pant and the Descente Marley Ski Pant We hope this information helps! " "how does the fit of this jacket compare to the rh+Kate I bought a large in it and it fits nicely but I wold like more room for layers on very cold days. What other jacket would you suggest with a roomier fit." "Thank you for contacting us. The rh+Kate and the Layla are very similar as far as the fit. If you are looking for something a little more roomier we would recommend the Obermeyer Tuscany II Insulated Ski Jacket or the Obermeyer Devon Down Ski Jacket. We hope this information helps!" "Can you remove the fur from the hood?" "Thank you for your inquiry. Yes, the fur on the Descente Layla Insulated Ski Jacket is removable from the hood. We hope this information helps! " "I am wondering about fit - I am a medium in North Face and Helly Hanson - the measurement guide suggests a size 12 but that seems to be bigger than what I would think. What would you suggest?" "Thank you for your inquiry. The manufacturer Descente runs smaller than The North Face and Helly Hansen. We recommend taking a look at the Descente size chart for accurate measurements. We hope this information helps! " "If I order the wrong size, can I return? Thinking of ordering 2 sizes..."
"Thank you for your inquiry. You can view our return policy here: Return Policy If you have any questions regarding this policy please let us know! " "
"Is it possible to purchase a replacement fur collar? I lost mine"
"Thank you for your inquiry. We do not sell the fur separately for the Descente Layla. We would recommend contacting Descente directly. We hope this information helps! " "Possible to purchase without fur. Saw at retail without fur." "Thank you for your inquiry. The "Descente Layla Insulated Ski Jacket with Real Fur" is only sold with the fur included. However, it is optional if you want to wear the jacket with the fur or not! The fur is snapped onto the hood and can be removed, then the snaps snap together for a nice finished look. We hope this answer helps with your Peter Glenn selection and purchase."